Just when you thought mantis shrimp could not get any more awesome, they did. Scientists have learned that mantis shrimp bounce polarized light off their bodies to communicate in super-secret shrimp code. The researchers published their findings in the journal Scientific Reports. If you’re new to Mantis Shrimp Club, you’re in for a treat. They look like Happy Meal toys but kill like assassins. And while our eyeballs have just three color receptors, theirs have 16, allowing them to see colors and images accessible to no other animal on earth. It’s these magnificent peepers that make shrimp code possible. 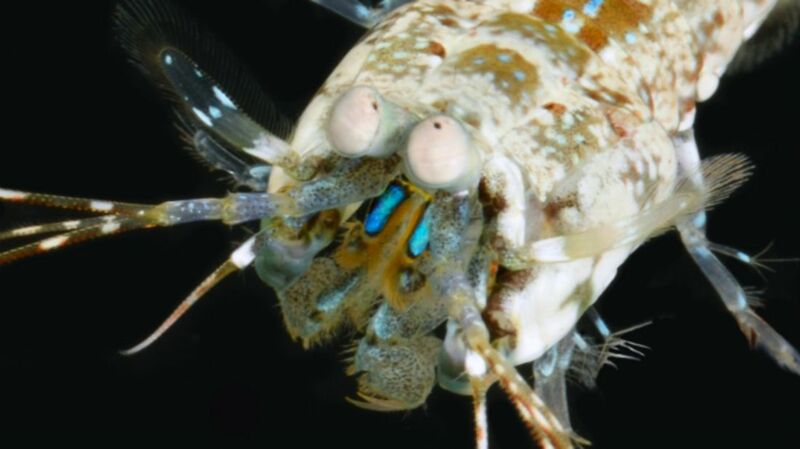 Mantis shrimp can see—and manipulate—polarized light. Other animals can’t, which makes it an ideal way to communicate without attracting attention. To find out just how the shrimp do it, scientists collected Haptosquilla trispinosa specimens off the coast of Australia and brought them back to the lab. H. trispinosa do their light-bouncing via little feathery appendages called maxillipeds. Each maxilliped sports a spot of brilliant blue, like the wing of a morpho butterfly. These spots are where the magic happens. Under a high-powered microscope, the shrimp’s blue spots became fields of thin, reflective cells. Analysis and computer modeling of light across those cells revealed an entirely new way of reflecting light. Most polarizing cells, including those invented by humans, bounce light into a reflective structure. The shrimp cells, on the other hand, unite to scatter light across the spot's surface, an arrangement that yields equally brilliant color and light.